The claim is made that barter of small amounts of marijuana in exchange for tobacco products is common in convenience stores in poorer neighborhoods and is not usually of concern to police. However, local prosecutors have disputed the film’s claims. The Washington Post has a story on the controversy by Kattie Mettler here. SXSW site is here. I can't find the film's own site or Facebook page yet. The fact pattern certainly suggests that Brown did charge Wilson’s car and that Brown’s own behavior when first approached by Wilson (which sounds hard to explain) contributes to what happened later. However, here is a recent article on Wilson’s remarks. 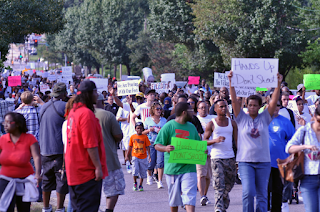 Wikipedia attribution link for picture of Ferguson protesrts Aug. 14, 2014 by Loaves of Bread, CCSA 4.0.